Liz and Andy just a few moments after they got engaged. 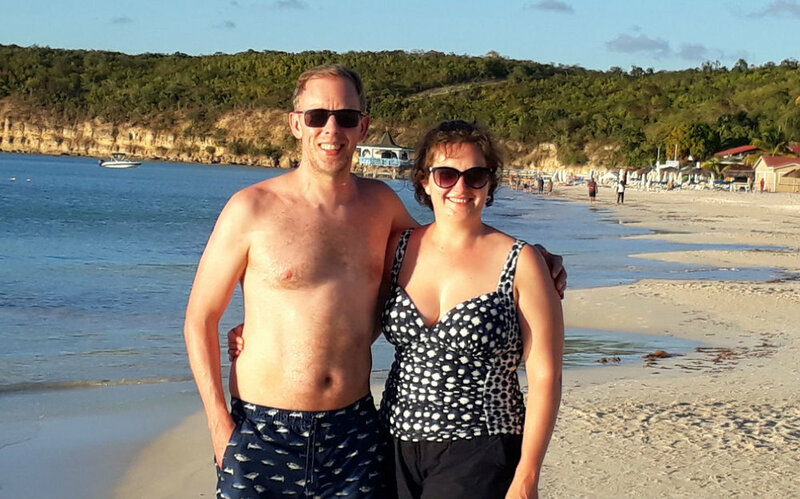 A while ago we introduced you to Liz and Andy, who had recently got together after meeting on MySingleFriend. They’ve just got back to us with an update to let us know that things are going swimmingly and they’ve just got engaged! Here’s a reminder of what they originally told us, plus their most recent news. “I only went on one date, though, and I wonder whether I have missed out on having some of those funny stories to tell, or whether I would have cringed and ditched the whole idea after one or two tries. . I would definitely recommend it to others with a caution to have an open mind and not judge people just on their photos or profiles. What are their emails like? What questions are they asking you and how are they responding to yours? And people can appear very different when you meet them face to face. “Since then we’ve moved in together and been on a couple of holidays. Andy comes to see my band play and comes to all my theatre shows, and I sometimes watch the snooker with him! We got engaged on our most recent trip to the Caribbean where Andy proposed to me on the beach. It was very romantic and we went out the next day and bought the ring together on the island, which will always be a lovely reminder of our dream holiday. Huge congratulations to Liz and Andy from all of us here at MySingleFriend! If you’re looking for someone special, sign up free to mysinglefriend.com and get searching!